For how long should it rest in the sanctuary and burn? I always felt that there was a certain mechanistic naivete in the reasons given for extinguishing it after the Gospel of Ascension day. I wonder if readers can supply information about the varieties of usage which have existed in the Western Church: I believe, for example, that in Durham Cathedral it burned for 50 days: from Maundy Thursday until the Octave of the Ascension. And if we ever restore the baptismal understanding of Pentecost which the older liturgical books encourage, it will certainly be neater to retain the Candle's use until at least Pentecost Sunday (since it is lit and made use of in the Blessing of the Font in the Pentecost Vigil). And I like the Novus Ordo idea of using the Candle at Baptisms and Funerals. I'm not a Pius V Fundamentalist! Such questions could do with being resolved; since it is very untidy, in those churches that give a home to both forms of the Roman Rite, for the Candle to be alight at OF Masses ... but dematerialised away for EF Masses. ... the Anniversary of the Restoration of our late Sovereign Lord King Charles II. The 1662 Calendar orders it to kept as a Red Letter Day. I suppose an obvious EF liturgical celebration would be a Mass for our present Monarch, Francis II. '... all things shall be well, When the King shall have his own again', as right-thinking people sing. Send him Victorious, Happy and Glorious, Soon to reign over us, God save the King. On Monday, as Pam and I walked along the tow path to see the eights practising ready for the exertions of Eights Week (read Zuleika Dobson if you don't know what bumping races are), we noticed that the wild white roses were already out. But White Rose Day, when loyalists used to celebrate with copious bumpers the Birthday of our late Sovereign Lord King James III and the Proctors used to fear lest the the Whigs send another military detachment to slaughter a few more undergraduates, is not until June 10. The times they are a-changing, to quote another Jacobite song. VIVAT REX. Or, as Dr William King proclaimed in the five (or was it more?) paragraphs of the peroration of his Latin speech at the Opening of the Radcliffe Camera in 1749 ( the last major public act of defiance against the Hannoverian Usurpation) REDEAT MAGNUS ILLE GENIUS BRITTANNIAE. Looking at my Site Metre, I see that visits are going down by about a thousand a month. Of course I realise that I am a Bore, but are there other, technical, reasons, which a technical approach might remedy? I am very technically uneducated. Since it is as much work to write a blog read by 5 people as by 100,000, one has a natural disposition to hope that one might be read by more rather than by fewer, if one is to feel it worthwhile to continue! If there are other participants in Saturday's CIEL Conference at the Oratory, as well as Sue, who see this blog, may I make suggestions in the hope that they, too, if they were to agree with me, might express their views to the CIEL secretary? Since 'we' moved from Spanish Place, we have not had a sermon. Perhaps I'm just, deep down, an unreconstructed Protestant (that's a rhetorical question), but I like the homily. Not just for its own sake, but because it seems to punctuate the Mass rather nicely. Pausing after the contemplation of the rites which dignify the Word seems to me the correct thing to do, rather than rushing on at once and feeling, at the end of the Mass, that it has slipped away just a little too quickly. And I do believe that the Proclaimed Word of Christ our God does involve a form of Transubstantiation; the Words which emerge from the mouth of Christ's diaconal minister are, by divine power and the ordained minister's charism, truly the Words of the Lord; they are not a record of something said 2000 years ago but teaching and commands uttered by the Redeemer in His actual Now, calling now for my reverence and submission. That is why the traditional dignities of chanting are so appropriate, and why, just as at the elevations of the transubstantiated Body and Blood, incense is offered. A bit of Gospel informally read in a 'meaningful' way by a jolly chappy would be deeply wrong. This is why I believe the Gospel should be accorded both dignity and contemplation before the Priest sings Dominus vobiscum and begins the Adorable Sacrifice. Secondly, I was disappointed not to hear discussion of Fr Crean's paper giving reasons for prefering the pre-Conciliar forms of Unction and Commendation. I felt both clergy and laity could have exchanged experiences and viesws, to our mutual profit. Fecunda sanctis insula,/ tuum canas apostolum,/et filium Gregorii/ laudes piis concentibus.//Eius labore fertilis,/ messem dedisti plurimam,/ quae sanctitatis floribus/ diu refulges inclita.// Turma quadragenaria/ stipatus intrat Angliam:/ vexilla Christi proferens,/ dux pacis affert pignora.// Crucis tropaeum promicat,/ verbum salutis spargitur,/ fidem quin ipse barbarus/ rex corde prompto suscipit.// Mores feros gens exuit,/ undisque lota fluminis/ ipsa die renascitur/ qua Sol salutis ortus est.// O Pastor, alme, filios/ a sede pascas siderum;/ in matris ulnas anxiae/ gregem reducas deviam.// Praesta, beata Trinitas,/ quae rore iugi gratiae/ vitem rigas, ut pristina/ fides resurgens floreat. It's in Gueranger, and the old Benedictine Breviary (the author was Benedictine). Lentini and co wanted to make the obvious bits more ecumenical, but I give you Francois Le Bannier's (d 1867) unexpurgated unbowdlerised original. Love is his bond, he knows no other fetter,/Asks not our all, but takes whate'er we spare him,/ Willing to draw us on from good to better,/ As we can bear him. There must be a sermon, or a lecture in a seminary Pastoralia course, in that. Altogether, a faultless and well-judged succession of edifying liturgical episodes (well, not quite; the choir did make a little booboos at start of Vespers. S Philip would have laughed at that). But then, a pretty well-judged Mass this morning at S Thomas's too, even though we were only three; EF Latin Mass of S Philip ... the rite the Saint knew and used daily (well, not quite; being Anglicans with a weakened sense of Sin, we do omit the Third Confiteor). I can't think of a better thing to do at 7.45 any morning of the year. Father Zed ... is he OK? Is he still Sound? Less and less Liturgy in his blog and more and more on the double tailed Texan hoopoe finch, followed by treatises on how to cook mussels the way they do it across the bacino in Venice. I calculate that, at this rate, by 2016 his blog will be 100% about Ornithology and St Epicurus the Unmartyr. I love the ancient Western Preface for the Ascension, preserved (although with an alternative) in the New Rite. One reason for my affection is the teaching that, through the Lord's Ascension, we may become Partakers of His Divine Nature. Because that, of course, is a preoccupation that sets us at one with Byzantine Christianity, and not least with the Hesychast Tradition. ( Shall I live to see a Sovereign Pontiff proclaim S Gregory Palamas a Doctor of the Universal Church?) Both lungs here breathe a harmonious doctrine. Dr Cranmer couldn't take this heady dose of participatory Christianity; he replaced it with an aspiration that we might also zoom up into the clouds (a bit of a dash of Rapture here?). Call me a dangerous modernist if you like, but I don't actually seek out over-literal images of a three-decker Universe in Liturgy, particularly not when the classical Roman texts prefer a greater sophistication. Old ICEL toned these words of the Preface down to 'sharing in the divine life'. Does anyone know what the New ICEL drafts have? Yesterday, while in London for the CIEL Mass and Conference at the Oratory (as always, fun), I found myself with half an hour to kill near The Victoria Railway Station (as our Court Circulars describe it). So I dropped into that large red-brick church nearby which is such a triumph of Edwardian taste over Byzantine intention. Two things struck me. The Sanctuary now seems to lack the small altar 1970s in front of the original altar. The lines of vision are such that it appears that Crucifix and six candles are on the original altar; in fact they are behind it. Good news: it looks better. Bad news: no evidence of a Benedictine arrangement. More bad news: papers and periodicals used to be laid out at the back, and I (and, I think, quite a few other right-thinking people) used to sit in one of the seats nearby and read the Tablet without paying for it. Now they've all disappeared, and live in the shop. I did think of taking one and sauntering off into the Cathedral to read it , but desisted out a desire not to be arrested for shop-lifting. Let us remind ourselves that the grand possession of Western Christendom, this great prayer, the Canon of the Mass, this noble Consecration prayer, for at least 1300 years, intact and immutable, formed the basis of the Western Rite. Without exaggeration we may describe it as the oldest liturgical prayer in Christendom. Through all the middle ages our English Rite followed it. It is free from anything that implies any mediaeval developments of eucharistic doctrine. It stands unaltered in the Roman Mass of today. It is our inalienable heritage as priests of the Church Catholic in the West. 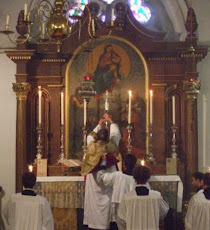 I don't understand why so many Catholic priests are so unwilling to use a Prayer which has attracted the enthusiastic admiration of generation after generation of liturgically erudite Anglicans. Anyway, as far as the Ordinariate is concerned, the Canon is our invariable act of Sunday Eucharistic worship. That, in its own, would be a jolly decent reason for belonging to the Ordinariate! The latest revision of the Novum Missal offers a Pentecost Vigil ... as the Old Rite did. I wonder if anyone in reach of S Thomas's would be interested in a very low-key celebration of the Old Vigil, perhaps on the Saturday afternoon? If one solemnly celebrated baptisms on the Whit Vigil (not that I propose to!) would this not mean that an octave - in which the neophytes wore their Whites until the Saturday - would be a logical consequence? Duffy quotes a lovely phrase from one of Cranmer's prosecutors: that Cranmer's "Gospell began ... with periurie, proceeded with adulterie, was maintained with heresie, and ended in conspiracy". In English Protestant usage, conduct which breaks every moral principle in the unscrupulous pursuit of some end has often been called "jesuitical". Would "cranmerian" be a more accurate term? The final breach between the English provinces and Western Catholic Europe is pinpointed by the Feast of the Nativity of S John Baptist, June 24 in 1559. On that day, it became illegal, according to statute law, for that Liturgy to be celebrated which had formed and sanctified the peoples of England since 596. From this rupture, affecting every parish church in the kingdom, flowed all the other discontinuities which have marred and corrupted our national life since that day. I'm sure readers will be able to think of their own ideas for an appropriate way to commemorate that day. For myself, I cannot think of anything better than to make absolutely sure that - whatever Eucharistic Prayer one might normally use - on that day one uses the Roman First Eucharistic Prayer: the prayer brought here by S Augustine and used daily for nearly a millennium. Wise words from the great Anglican liturgist G G Willis: In liturgical quality, both of language and structure, it excells all other Eucharistic rites...it is the best one available ... It is time for the Church of England to forsake inveterate prejudices derived from Reformation Protestantism, and to accomplish something in liturgical revision which would give unity and peace on the basis of an ancient and well-tried form of prayer. The Oxford branch meets tomorrow, TUESDAY, in Pusey House at 7.30 for 8.00. Ian Boxall will talk about the reception in the Church of Revelation 12. This year represents the 450th anniversary of the saddest event in the history of England; when the Provinces of Canterbury and York were forcibly sundered from the unity of Western Christendom and from the See of Peter. For Anglican Catholics, at this particular moment, such a commemoration is not merely 'History' and 'Heritage'; it relates directly to where we are now and where we are going. There is a sort of symmetry between that sundering, and the sundering involved in the decision of 'our' bishops and synods to dump the ARCIC ecumenical process which seemed so promising and, in place of ecumenical convergence, to choose a path of deliberate and irrevocable (because structural) divergence. At this timely moment, Professor Eamon Duffy has published his Fires of Faith: Catholic England under Mary Tudor (Yale; ISBN 978-0-300-15216-6). It should be read by everybody with a serious interest in the history of our provinces at that particular turning point and moment of rupture; it demonstrates the vibrancy of Marian Catholicism, its popular appeal, its intellectual strength, its personal heroism. It demonstrates how England, as a unique locus in which Protestantism had been turned back and replaced by a renewed and invigorated Catholicism, became an early laboratory for the Catholic Counter-Reformation. Duffy shows how the English Counter-Reformation of 1553-8 helped to shape the reforms of the Council of Trent and of Catholic mainland Europe. Did you know, for example, that S Charles Borromeo incorporated Cardinal Pole's decree on Pastoral Visitation word for word into the document issued by his first Milan Synod of 1565? When you've read Duffy, you'll know a lot of significant details like that; and you'll have a clear understanding of how Whiggish historiography has corrupted our national memory of that brief but exciting five years. The ORDO which for so many years I have compiled ... IS currently being printed. I say this to reassure worried users; the TuftonPress/Church Union withdrew the publication of it from the Canterbury Press because of unresolved problems concerning the ideology of some of the advertisements which Canterbury Press included. The ORDO will be distributed by THE ADDITIONAL CURATES SOCIETY (Gordon Browning House, 8 Spitfire Road, BIRMINGHAM B24 9PB; Tel 0121 3825533; info@additionalcurates.co.uk). The 2010 edition will appear a little later than hitherto, but I trust its appearance will not be much longer delayed. The ORDO will continue to provide full information of the Calendar both of the Modern Roman Rite and of Common Worship, plus the local calendars of the provinces of Canterbury and York, of Wales, Scotland, Dublin, and Armagh, and the modern Roman RC calendars for England and Wales. It also provides full daily bible references for the readings at Mass and the Office in the Church of England, and in the current Roman Mass Lectionary. It includes full and, I hope, up-to-date directions for the particular observances of the Liturgical Year, according to modern Western usage. There are some historical explanations, and information from Orthodox sources which throw light on Western Liturgy. It gives the full 1961 Divine Office Lectionary designed to complement the 1662 Prayer Book. And, in view of the growing interest in Traditional Liturgy, it gives growing amounts of guidance to those who wish to give their worship an increasing bias in a traditional direction (whether Prayer Book or Roman); although it does not yet give the full 1662 and Roman 1962 calendars. "The fabled clergyman who gave out from his pulpit, "Today is Easter Day; last Friday was Good Friday, but as it was overlooked it will be kept next Friday", might have spared himself these embarrassments if he had possessed a copy of the unpretentious but tastefully produced booklet that reaches us from Burns, Oates, & Washbourne, entitled Ordo Recitandi Divini Officii, etc., etc., etc. (1/6 net). The author modestly preserves anonymity, nor does he betray his identity by any marked individuality of treatment; but his colleagues will be glad to welcome a piece of solid work from his pen, and will not fail to recognize his attention to detail and his terse, nervous Latinity." I'm sure you'll have no trouble guessing who, in 1923, wrote that? "Arise, Mary, and go forth in thy strength into that north country, which once was thine own, and take possesssion of a land which knows thee not. Arise, Mother of God, and with thy thrilling voice, speak to those who labour with child, and are in pain, till the babe of grace leaps within them. Shine on us, dear Lady, with thy bright countenance, like the sun in his strength, O stella matutina, O harbinger of peace, till our year is one perpetual May. From thy sweet eyes, from thy pure smile, from thy majestic brow, let ten thousand influences rain down, not to confound or overwhelm, but to persuade , to win over thine enemies. O Mary, my hope, O Mother undefiled, fulfil to us the promise of this Spring." Discuss whether this fragment is best assigned to the authorship of Cardinal Newman or to that of Father Faber. What fun getting around; to Reading on Sunday, Leicester on Monday, to preach during this Marymonth of May. I enjoy meeting brother priests; hearing about their immense joy in their priesthood and about their sense of incomprehension at what the Church of England is doing to us and to God's people. In this matter of Women and Holy Order Catholics in the C of E have had the privilege of fighting for orthodoxy, meeting error in very tangible forms in diocesan and deanery structures, in the persons of bishops and archdeacons and neighbouring clergy, and of witnessing to truth in a way that R C clergy do not have. There is a tremendous sense that we have won all the arguments ... and lost the war. But Deo gratias for what God has done through us. And it's fun meeting their layfolk, some very devout, others fringe members, and so very diverse and often so earthed. At both churches, I confess, I employed the same homily. At both we sang that lovely hymn from the ECHB The happy birds Te Deum sing, 'tis Mary's month of May (Does anybody know who wrote it?). But S Giles Reading and S Andrew's Jarrom Street represent two tendencies in the rich diversity which is Anglican Catholicism. At S Giles' there is lace and there are birettas and Benediction in Latin and Ave sanctissima ave purissima. As one preaches, one is disciplined to be sparing in one's deployment of the Holy Names of Jesus and Mary by the need to joggle one's biretta every time one utters them (I happen to think that this is very good discipline ... I suggest you work out why). At Leicester, it was modern vestments and concelebration and ICEL 1970 and a delightful band to lead us round the streets past Victorian terraces with a large number of student digs. I don't know who composed the melody of the Lourdes hymn, but I bet they never guessed some of the contexts in which it would be heard. I was a bit of a cad at S Andrew's; I used the First Eucharistic Prayer even though my concelebrants were not expecting it [' ... Benedict our Pope and Keith our Bishop ...', in case you're wondering]. I made up for it by not asking for the Benedictine Altar arrangement. Call me chicken if you will. For many years Jarrom Street was one of our great papalist centres under the legendary Canon Badger; and I heard stories about him from older worshippers who had known him in their younger days. I made a private memento of John Higginbotham, a long-time colleague and friend at Lancing; a fellow Classicist and a doughty (that's a word we Anglican Catholics have always loved using) protagonist for the Faith, at Lancing and then in Leicester (where he founded a new Grammar School) and on General Synod. It was lovely to meet his widow Clarissa again. John's aloof academic manner used to nonpluss unbelievers; asked why he was a Catholic he would loftily observe that, having considered everything on the grounds of strict logic, he had been drawn, as anybody must be, to the ineluctable conclusion that Catholicism is Truth. If S Andrew's Altar was, in a sense, Fr Badger's, S Giles's (as I wrote in a recent post about the church and Fr Melrose) was Blessed John Eynon's. In each case, I had a sense of praying where great men had fought and standing with them among a great cloud of witnesses. And in both places I found myself reflecting that we have our secret weapon, the Mother of God, supplex Omnipotentia [suppliant almightiness]. She cannot let us down. I have just been perusing an overview of the growth of 'liberalism', given in 1982 by Archbishop Lefebvre. It includes a highly personal account of the dominance acquired by Bugnini over all manner of people. The account is at sspxasia, then by Library of Catholic Documents Archbishop Lefebvre, then 1982. This morning, since today is festival day at the Marian shrine at Nettuno, twinned with the Shrine of our Lady of Grace at Ipswich, I dipped into the Missae pro aliquibus locis and said the Mass of our Lady Matris Gratiae. Does anybody know if this was in fact the Mass used at Nettuno in the days of the Old Rite? We approach the Vigil of Pentecost. Does anybody have knowledge or experience of the Pentecost Vigil as laid out in the old Missal being done in recent years; or of it being done without choir and with minimal assistance? Those of you who monitor the preposterous: can you tell us if the Barmy Bishop of Bux is still functioning? Is he still blogging, still gracing the world with his deft analyses, still dipping an agile foot into everything squelchy? Or, as I fear, has the Bishop of Oxford (whom I suspect of being a bit of a Fellay) shut him up? I do hope not. In this sad, gray, sombre decade, starved of the eccentric, what we need is more episcopal nutters, not fewer. Fr Zed reveals that Notitiae has published a list of corrections to the Missalis Romani Editio tertia. They include corrections of grammar. I have been shocked over the years as I looked at the propria novissima published in Notitiae to find that, time and time again, IV form errors in latinity jumped up at me off the page. I recall there was a nastiness in the first form of the collect published for S Edith Stein; but the lectio for S Padre Pio was a tour de force in the absolutely disgraceful. The 1869 Breviary I use for Dominical and Festal Vespers ... not unlike the 1950s Missal I use over in the church ... has a nice bit at the front by Victor Augustus Isidorus Dechamps, Dei et Apostolicae Sedis gratia Archiepiscopus Mechliniensis, Primas Belgii, Sanctitatatis suae Praelatus domesticus et solio pontificio assistens, all about how he has obeyed a decree of Urban VIII to have printers' proofs carefully checked per revisorem a nobis deputatum. Before the Council it was inconceivable to come across even minor typos in a liturgical book. Now they abound; just one big example: if you use the Second Edition of the Liturgia Horarum, check through the patristic reading for the Cathedra S Petri in the two versions in the two volumes in which it is printed (it can come either before or during Lent). And not just typos galore, but substantive errors in Latin originals. !n 1998, as Lancing College celebrated its 150 years, we sent off two letters asking for blessings; one, in formal Byzantine curial Greek, to the Ecumenical Patriarch, one, in equally formal Latin, to the Sovereign Pontiff. The former replied most graciously with several pages in the same style of Greek; the latter replied not at all. My conclusion was that nobody at all knows any Latin at all in the Vatican. Except, of course, for Benedict XVI. He's no fool. He took care to write the new Prayer for the Jews himself. The quebecoise who visits S Thomas's only joins in the (Greek) Kyries. I feel there must be a message in this. Perhaps readers could spell it out. Would she be happier if I added S John Chrysostom to my personal repertoire of rites (1662; Common Worship; Tridentine Latin; Tridentine English; Novus Ordo English; Novus Ordo Latin)? And I wonder if anyone could help with the following problem. Although a generally well-equipped church, S Thomas's does not possess any relics/reliquaries; not even, as far as I can ascertain, let into the cavities of the stone altars. I feel a bit of a fraud as I say ...quorum reliquiae hic sunt ... Can anybody help with an authentic relic or two? Today my EF Mass was a Votive of the Invention of the Holy Cross; answered with her usual competence by my learned churchwarden. Also present a lady, francophone, from Quebec; last time she came, she got 1662 (Canon Romanus interpolated, of course). She seems very laid back about the variations. And a live subdeacon; a gentleman with a foot in the Province of Canterbury and a foot in the Traditional Anglican Communion. He says that S Thomas's has featured in the TAC newsletter. I would like to see what they said. Tomorrow, I purpose to say the EF Mass of the Octave Day of S Joseph with Commemoration and Last Gospel of S John ad Portam Latinam. I'm sure this all comes under the umbrella of "variations not of substantial importance" from the provisions of Common Worship. While in Pusey Library to check a reference or two, I noticed on a windowsill a Missal, ALL handscribed, from the (Anglo-Catholic) shrine-parish of Hoxton, dated 1907. It gives the whole 1662 Rite with the whole Roman Rite in Latin to supplement it (propers and all). What a labour of love. But Mass must have been rather long. "Complexities", I wrote in my last post. When I was in Devon, with six churches to care for single-handed, I used to say as many as four Masses a Sunday. So of course I understand what Maurice and Pastor mean in their laconic observations. When I wrote "complexities" I assumed that what I meant was so obvious as not to need spelling out. The folks are there and you've got to do it. What I was asking - and apparently doing so too obscurely - was, how we might get back to sounder instincts, in which one priest says one Mass for one people of God. I asked the question precisely because our present situation seems so many millions of miles from such a possibility. I do not see how we can even get within range of speculating on such a reform without asking more basic questions. I do wonder - and this is a question and neither an answer nor a prescription - whether we are too anally retentive about priesthood; too inclined to professionalise, clericalise, restrict it. A devout man could be taught the mechanics of saying Mass quite easily. But for him to preach, he needs an education in Scripture and dogmatic theology; to hear confessions, a training in moral theology; to administer a parish, a training in canon law. I wonder if it is inevitable, in all times and all places, that we only make man a priest if he is capable of so being trained, and has been so trained, as to be safely permitted to do all these things. When, in my youth, I used to go to Greece, it was clear to me that the country parochial clergy were trained to a comparatively low level of competence. In the English Middle Ages, there were manifestly greatly differing levels of priestly proficiency. Until comparatively recently, clergy needed a licence to preach. I know we gained immeasurably much from the Tridentine reforms, the invention of the Seminary, and all that. But it is not completely clear to me me that different cultural contexts might not suggest different possibilities. What I do know is that in the Church of England, at least, we get the worst of both worlds. We have a horror of "mass priests", by which is meant people who just offer the Eucharist. So we try to train all clerical aspirants up to a level at which they all can safely do everything. Sometimes this is attempted in an-evening-a-week courses. But - as everybody knows who knows anything about present-day Anglican church life - we still have an increasingly poor quality of priesthood (reflected in a low level of of episcopal competence: most modern bishops would have been lucky to have been made rural deans a couple of generations ago), and most of these clergy can't even do the mechanical basics with any competence. And a shortage of clergy despite that. And despite trying to plug the holes by relying on the 'priestly' ministrations of unpaid divorced elderly women. On May Day the distinguished compiler of the S Laurence Press Ordo visited me and, after serving my EF 11.30, told me over coffee about its history ... and his clientele. He convinced me of the comparative richness of the old propers for S Joseph in Eastertide, which were abolished when the rather superficial celebration of S Ioseph Opifex was invented. And, looking at his Ordo, which now has an honoured place in my sacristy just under the picture of Benedict XVI, and realising that today we would have been celebrating the (Prayer Book) festival of the Invention of the Holy Cross, I wondered whether there was indeed something to be said for a feast of the Lord's Passion in Eastertide, so that we can, as it were, look upon those glorious wounds suffused with Resurrection light. I've probably got this all confused, but didn't S Margaret Mary report the desire of the Lord for his Sacred Heart to be celebrated on the Friday in Easter Week? And after our Syrian Orthodox guests had finished their Liturgy, I was gossipping with Father; he told me, in tones of great disapproval, that he had heard that Roman Catholics did not observe the Eucharistic Fast. The disapproval darkened when he reported to me that R C priests sometimes even celebrated Mass twice on the same day. "The Lord was born once, crucified once, rose once, and will come in judgement once", he observed with emphasis. I've got a feeling he's right. But however can we hope to reconnect with these instincts, sanctified as they are by loyalties both synchronic and diachronic? Given the distance we've travelled away from them since Pius XII (has anybody ever made a sedeprivationist case against him? ), and given the complexities of modern life? Is May Day really observed (on May Day) anywhere in the world apart from Oxford? Pam and I went down to Magdalene bridge and listened to the Latin Hymn to the Undivided Trinity, which, this year, was followed by an (English) prayer, quite decent in form and content, then a madrigal. We then admired the Morris Men (nondum - laetanter dico - exstant mulierculae morrisianae) and sauntered to S John's for their madrigals. This year they were preceded by Prayer; which rather irritates me. It's so divisive; some aged parson, dressed in what I believe is called a "sarum cassock", started off with a prayer addressed to "Creator God", which I take to be a formula expressive of the New Religion. He then moved on to a prayer referring to the "friends" of Jesus whom "we observe today; James and John". Is it a local usage in S John's College to observe James and John rather than Philip and James; or was the poor old boy just gaga? I must try to find out. Then I looked at my watch and decided that there was yet plenty of time before I needed to return to S Thomas's for our Extraordinary Form Mass in honour of SS Philip and James; so we went, in the company of a young man of Indian appearance dressed in tall hat, long coat and concomitants, spats and patent leather shoes (Oxford is such a normal place), to Hertford College for madrigals from the bridge. Nicely done, although I say so myself (I am a Hertford Man, but prefer to think of it by its medieval title, Aula Cervina). No prayers here, thank God. But one of the madrigals coincided with the second of the S John's songs, having a refrain apparently referring to 'hymns to Diana' (at S John's they sang "Die-anna"; at Hertford "Diahna"; but I take it that the deity was the same). You know how the mind wanders; it reminded me of a hymn in sapphics written by Athelstan Riley which, though disused, was still in the Lancing College Hymn Book. The adonius at the end of one of the stanzas was "Dumb Dead Diana". I tried to persuade the Director of Chapel Music to bring this jolly ditty back into our repertoire in the hysterical aftermath of the demise - oops, sad demise - of Diana Spencer; but he declined. Why are musicians such cowards? Yesterday, to Reading with the brethren of the local chapter of the SSC. Mass at S Giles, celebrated by the learned and right-thinking Fr Melrose; Novus Ordo but with the Canon Romanus in Latin, said with the practised ease and accuracy that comes from regular use. We did the Pax with a relic of the True Cross; and afterwards I took the oportunity of saying a prayer at the shrine of Frather's predecessor as Vicar of S Giles', Blessed John Eynon OSB , martyred (or as Father, who gives no hostages, put it, 'murdered') by Henry VIII (not to be confused with our more recent Sovereign Lord Henry IX). An all too brief homily on S Pius V, who, as Father explained, was a great lover of the Church of England. How nice it is to be among people who see History the right way round. But then, Fr Melrose can be expected to be accurate, because he has just about the most covetable clerical library I have ever seen ... surpassing even that of my friend Fr John Shanahan, pp of Knightstown on Valentia Island in the blissful Kingdom of the West. ... but, Roman Cathoilcs among you are clamouring to know, what is the SSC? The Societas Sanctae Crucis is a priestly society (I think you would call it a secular institute in the RC Church) founded in 1854 and with about a thousand members. It is dedicated to sancyifying the priestly lives and pastoral ministries of its members, who have to be orthodox catholics in belief and practice. It supports individual priests by meetings for prayer, study, and fellowship, and by a Regula Vitae drawn up by Dr Pusey.